Orders received before 2:00 pm Eastern time ship the same day. Orders are shipped using FedEx, unless you specify a different preferred carrier. Time-in-transit depends on your geographic location. From our location in Tennessee, time-in-transit to the west coast via FedEx Ground shipping is four to six working days. 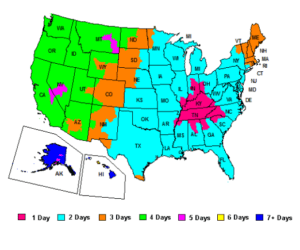 Please refer to the accompanying FedEx time-in-transit map for Ground delivery times to your geographic area. FedEx does not count Saturday, Sunday, or holidays as working days. We also offer Next Day Air, Second Day Air and Three Day Air service upon request. Our web site calculates the cost of shipping via Fedex Ground, Three Day Air, Second Day Air, and Next Day Air. If you wish your order to ship via another method, please email, phone or fax your order to us so we can handle your order appropriately. Orders going to Hawaii and Alaska via FedEx must ship via air service, which adds to the shipping cost. Customers in those states may prefer their orders to ship via Priority Mail, which for some items offers a lower shipping cost. Please let us know if you prefer Priority Mail shipping. Alcohol Gas Tanks are considered a hazardous material and cannot ship using Priority Mail. A $35.00 Hazmat fee will be applied to orders for Alcohol Gas Tanks shipping via ground shipping services. Hazmat fees for shipping these products 2nd Day Air and Next Day air is $49.00. We regret that our web site cannot accommodate international, APO, or FPO addresses. We ask overseas customers to please email orders to sales@kahntactmedical.com or contact us by phone at 1.708.449.5470. We can estimate shipping charges for your order and email you shipping cost information. Alcohol Gas Tanks cannot be shipped to APO, FPO, or international addresses.